As a commitment to transparent decision making I wanted to pass along my thoughts on the recently approved 2016 non-tax supported operating and capital budget. More specifically, the 4% increase in Guelph’s Water/Wastewater rates. You may remember I did not support this increase in 2015. To read more on this please see http://www.ward1guelph.ca/2015/01/my-thoughts-on-the-non-tax-supported-operating-budget/. In terms of this year however, I wanted to share my rationale for supporting the 4% increase in 2016. The following were the primary factors influencing my decision. 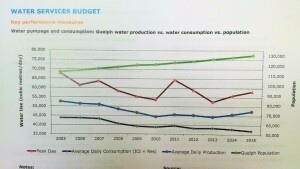 Firstly, as noted last year, progressive water pricing in Guelph is working as an effective conservation tool to offset future investment needs in wastewater treatment. 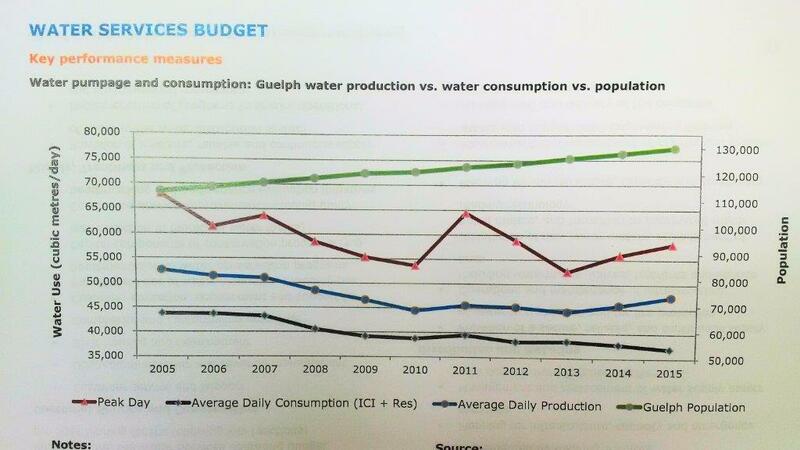 Noted in the figure below, as Guelph’s population continues to grow, over the past ten years we have continually seen a downward trend in our average daily consumption (average daily production has been increasing in recent years due in part to frozen pipe issues). This conservation initiative is a credit to both improved building standards and volumentric water pricing, and has effectively deferred >$39M in future wastewater treatment expansion projects for our City. For a city exclusively dependant on groundwater for drinking water production, effective conservation through volumetric pricing is good policy both fiscally and environmentally. Secondly, for a second year in a row I was encouraged to see a downward trend in the purchased services line item of the Water Services budget. This was a primary concern of mine during last year’s process. Since 2014 purchased services has decreased from $3.1M (2014) to $2.8M (2016) which is an encouraging sign and points to >$300,000 in annual efficiencies over that time. Further, internal charges within the water services budget were reduced in 2016 from $3.1M (2015) to $2.9M (2016) and is another positive sign of internal efficiencies. Finally, I believe the 4% increase is most appreciable when considering the pressures our City’s Water and Wastewater services faced in 2015. Specifically, the frozen pipes emergency, which effected over 400 customers and incurred hundreds of thousands of dollars in increased costs and lost revenue. To this end, the 4% rate increase includes a new contingency fund transfer of $440,000 to replenish the depleted reserves and increases the available funds required to respond to these types of events moving forward. Further, with no emergency relief assistance from the province, water services creatively deferred $625,000 in routine maintenance spending to absorb the costs associated with the frozen pipes event. This, in addition to the new cost of monthly billing and a 3.9% increase in electricity rates year over year (additional $55,400 cost), I believe demonstrates how the 2016 non tax supported budget increase of 4% absorbs a tremendous amount of new pressures and demands on the system. When considering all of the efforts made to reduce cost burdens on Guelph ratepayers, as well as the unforeseen and added expenses of providing the service in 2015, I want to congratulate our City Staff on their efforts in the 2016 budget. To offer the same, high quality service in 2016 for an additional $31/household is an achievement in and of itself. As always if you’d like to discuss things further please do not hesitate to contact me.